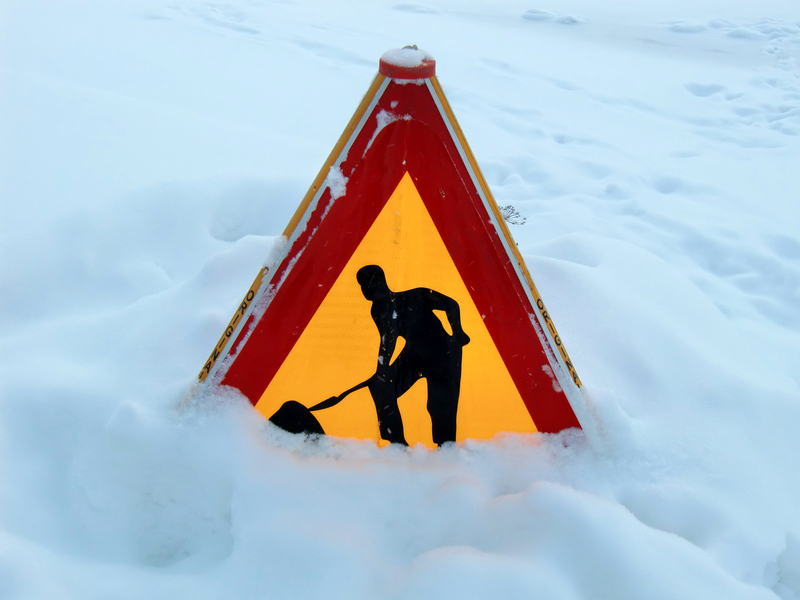 Digging out: It seems that’s all we’ve done since the “polar vortex” descended upon us in January. Snowfall has been seemingly heavier than usual. The chore of cleaning off driveways, sidewalks, and cars has produced a constant source of stress in homes. We have to get up earlier and dress more warmly and then attempt to drive in less than ideal conditions. When will it end? Is there any point? Do we just give up? Oddly enough, we can use this winter to help us focus on Lent. The burden of sin is much like the snowfall this year. It seems to keep coming. No matter what we do, there is always more to shovel. Lent becomes the season of digging out, but hopefully not merely to allow another storm to block the paths to our homes, hearts and minds. By God’s grace in the discipline of the Fast, we can keep digging knowing that ultimately spring comes, not merely the temporal season, but the eternal one. Without eyes set on Pascha, it’s hard to believe that repenting and attempting to live a more godly, Christ-pleasing life has any real merit. Won’t we simply turn around again and find another spiritual “vortex” covering and slowing us down again? Yet, we know that if we don’t dig out of the snow, we will eventually become paralyzed, isolated, locked in our homes with no way out. So too with the Fast, we fast to dig our way out again. As with this winter, we keep digging. There is a point, there is a purpose. While Pascha doesn’t promise the absence of spiritual storm, it does promise hope during foul weather in our souls, and an eternal victory where no storm clouds roll. Judy’s friends and family celebrate her 10 years of service to the church at a reception in February. 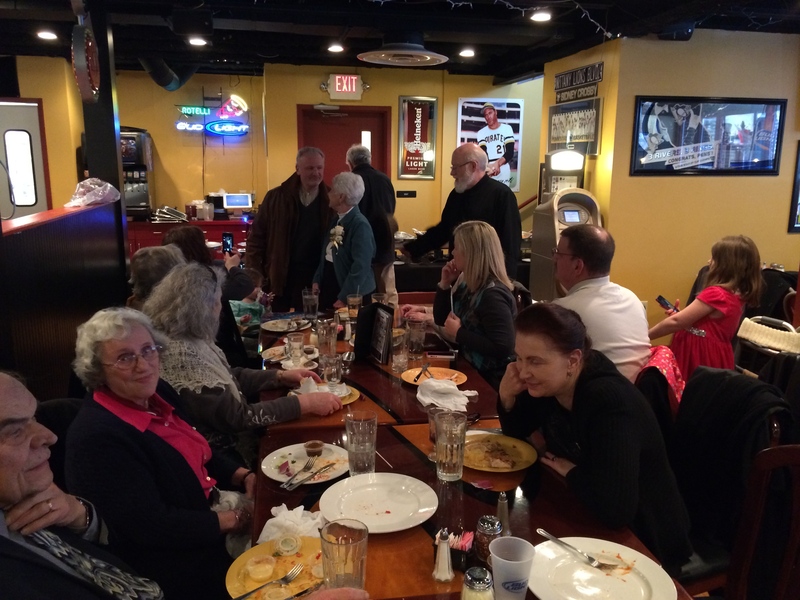 It was a joy to surprise Judy Fryncko with a celebration of her ten years of service to the parish with a luncheon at Rotelli’s on February 9. Yet that doesn’t tell half the story of her dedication to this parish. Even before most of us thought about arriving on this scene, before Holy Trinity was even a mission, when it was only a hope and a prayer, Judy was doing those many unheralded things she always has done, with grace and graciousness. We are truly thankful to have her through it all. We can never thank you enough, Judy! Good News for our Chapel: The Archdiocese is drawing up plans to loan money for the construction of a temple in Beavertown. A special parish meeting will be called in May to authorize the transaction. Meatfare Sunday marked the start of another HTOC tradition when singers and their families enjoyed a sumptuous spread at the Choir Social held at the Rectory. Not surprisingly, meat played a major role in the potluck entrees. Confession: Don’t wait until the last minute to make yours during Lent. While those receiving Holy Communion regularly should already be going to confession every month to six weeks, confession during Lent is obligatory for all Orthodox Christians. Confessions will be heard following Saturday Vespers, on Wednesdays and Fridays at 5 p.m., or by appointment. If you need to confess more than once during the Fast, please do not do so more than once on Saturdays out of consideration for others. Confessions are not heard during Holy Week.